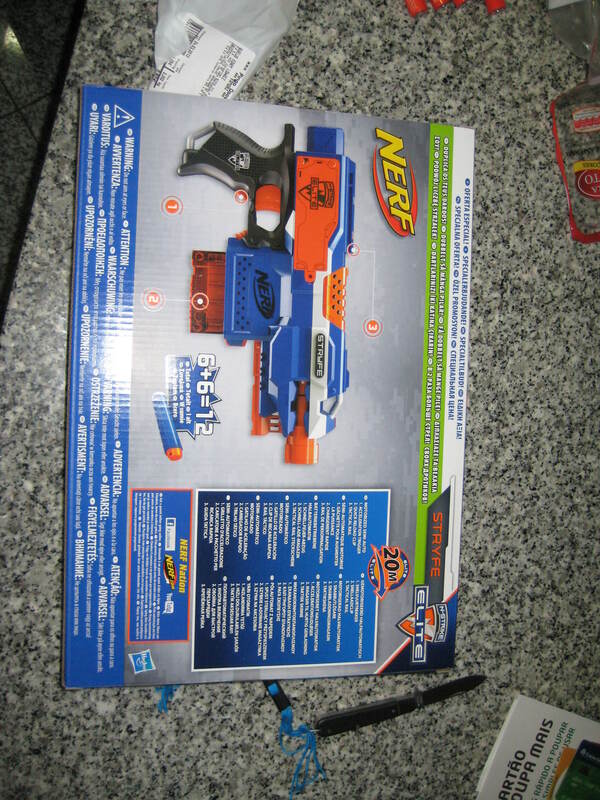 No Domingo à tarde fui comprar uma Nerf Elite Stryfe à Centroxogo. 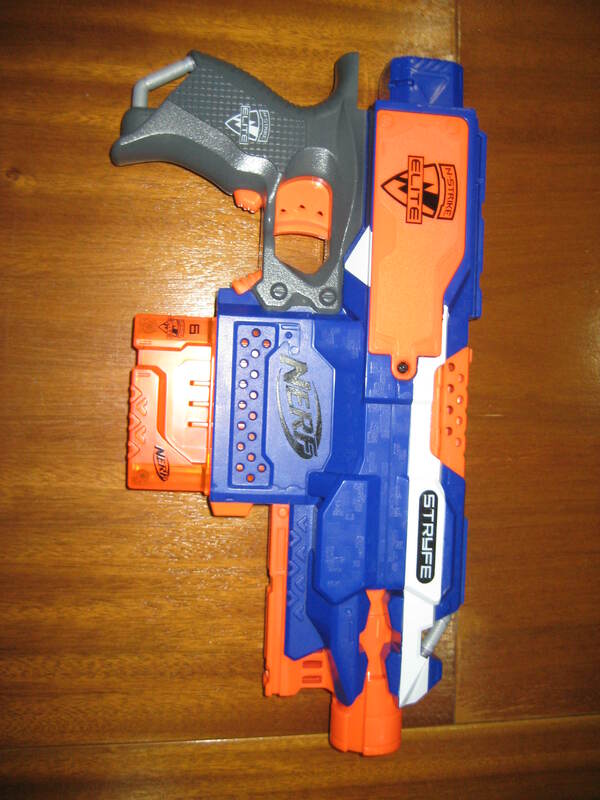 A Stryfe que comprei era uma edição especial com o dobro dos dardos. 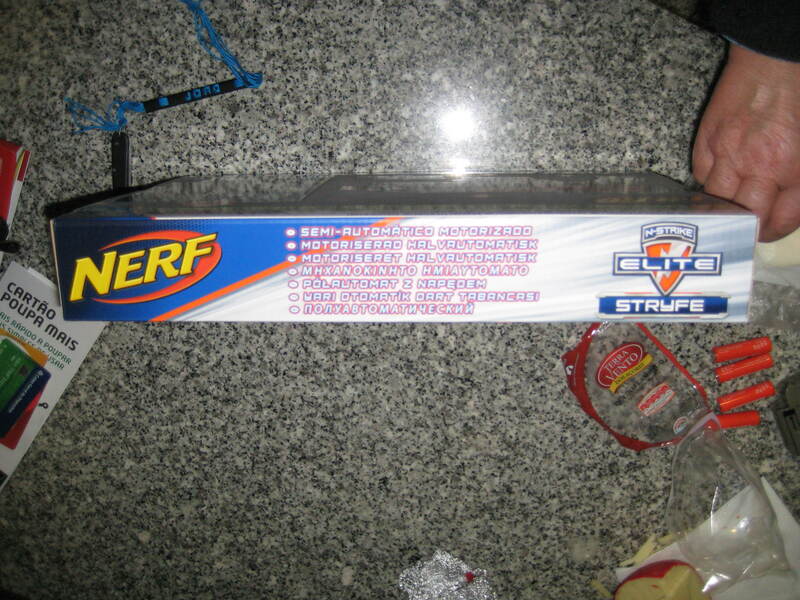 No exterior, na frente vemos os logótipos da Nerf, da Hasbro e o logótipo Elite, um rapaz com uma Stryfe, diz que é semi-automática, que são precisas 4 pilhas AA e a caixa reclama 20m de range (versão internacional); no lado direito vemos a Stryfe; do lado esquerdo vemos um rapaz com o Colete Elite, com algumas blasters e vemos o logótipo Elite; em cima diz que a Stryfe é semi-automática e em baixo vemos a Retaliator e a Hailfire, nada de novo. 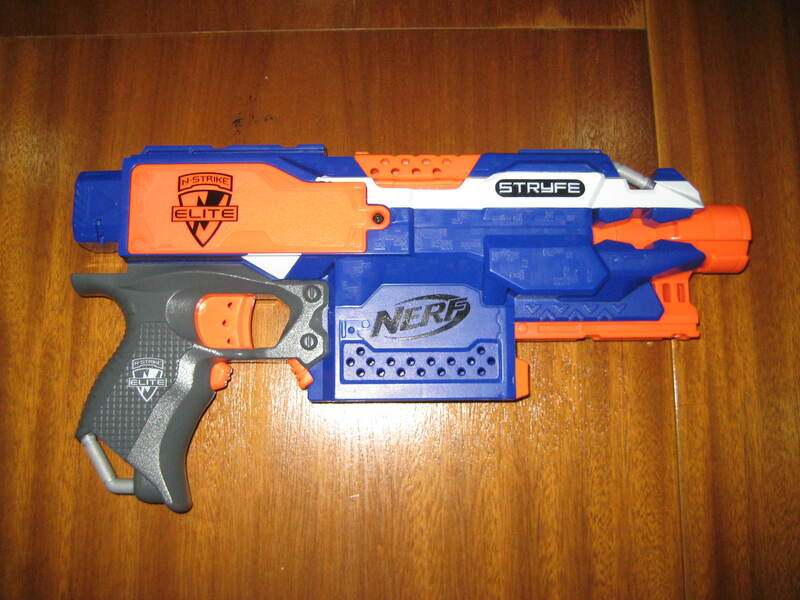 Atrás, vemos a Stryfe, onde estão destacados o “Gatilho de Acelaração”, o “Carregador Rápido” e o “Trilho Tático”(Tactical Rail), vemos também uma advertência para a Nerf Nation. 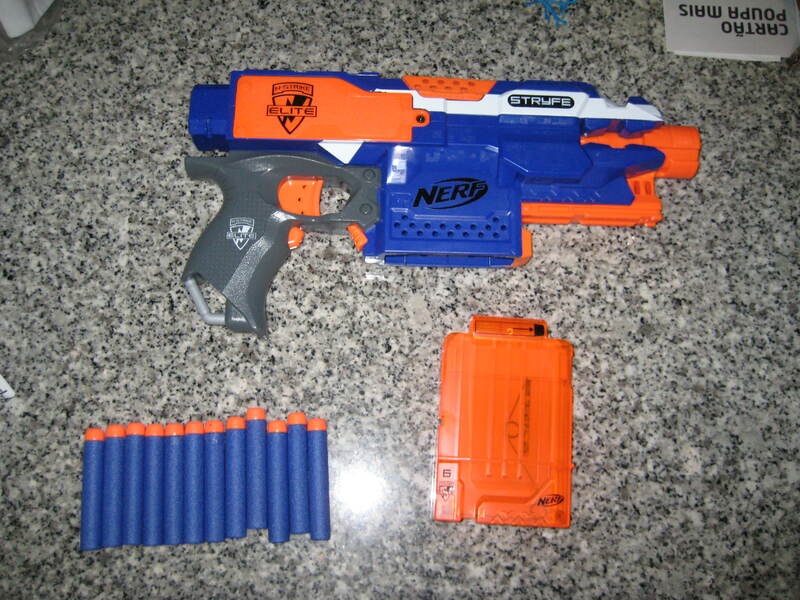 On Sunday afternoon I went to buy a Nerf Elite Stryfe to Centroxogo. 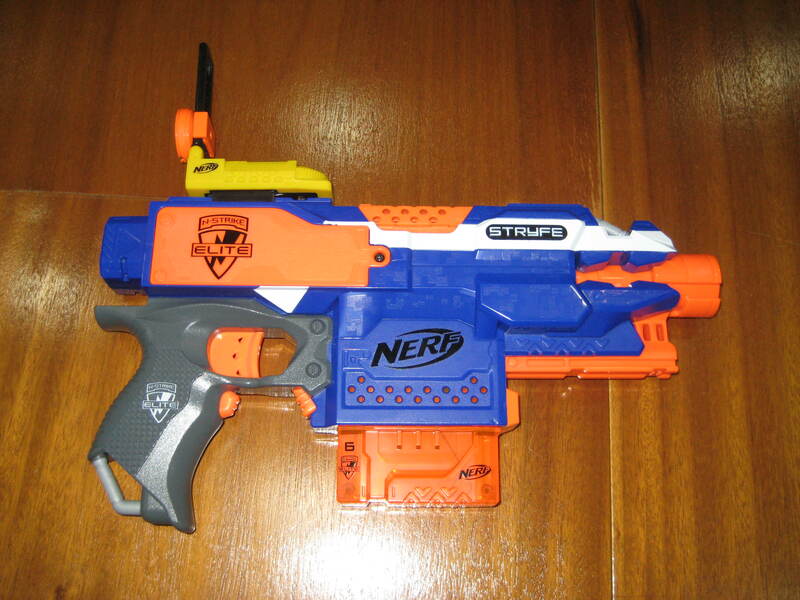 The Stryfe I bought was a special edition with double of the darts. 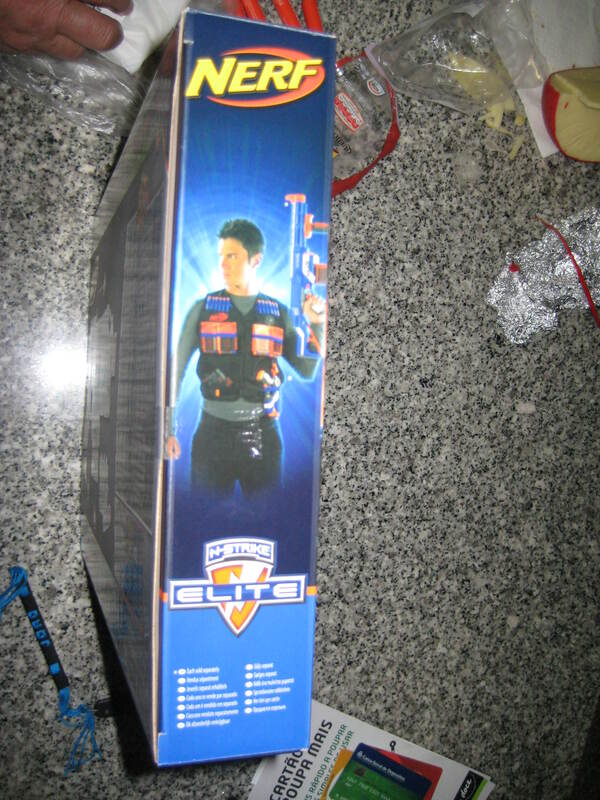 On the outside, in the front, we see Nerf and Hasbro logos, and the Elite logo, a boy with the Stryfe, says it is semi-automatic, it takes 4 AA batteries and the box claims 20m range (international version); on the right side we see a Stryfe; on the left side we see a guy with Elite Vest, with some blasters and see the Elite logo;on the top side says that the Stryfe is semi-automatic and on the underside we see the Retaliator and Hailfire, nothing new. 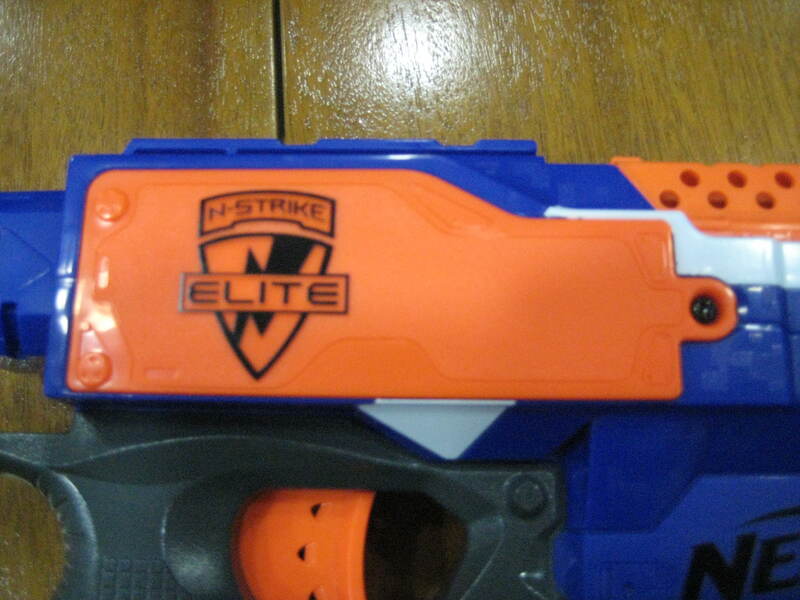 On the back side, we see the Stryfe, where are posted the “Acceleration Trigger”, the “Quick Reload Clip” and “Tactical Rail”, we also see a warning for Nerf Nation. Quando abrimos a embalagem, vemos que com a Stryfe vem apenas os Dardos e o Carregador(Clip). 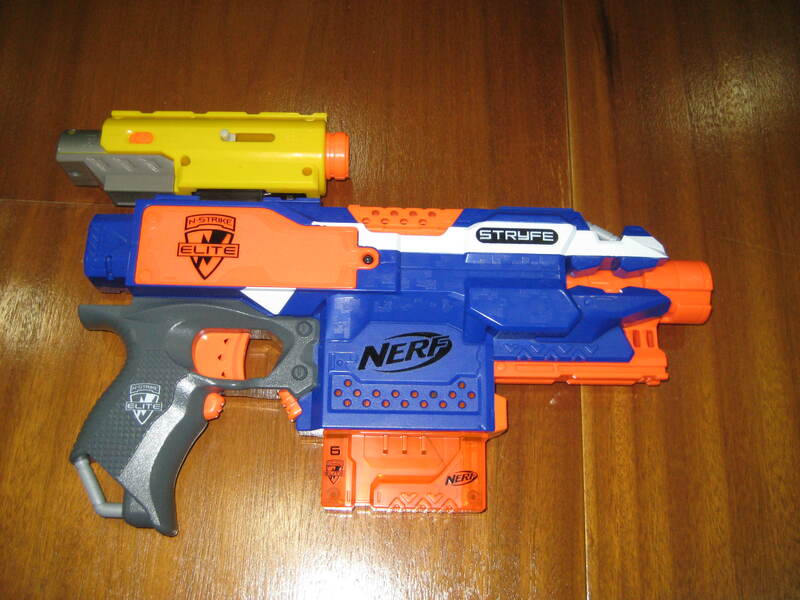 When we open the box, we see the Stryfe, Darts and the 6 round clip. Para por-mos a blaster a trabalhar, necessitamos a abrir o Compartimento das Pilhas com uma Chave de Fendas. Inseri-mos a pilhas, e fechamos o Compartimento das Pilhas de novo com a Chave de Fendas. Devo lembrar que a blaster não vai acionar as Flywheels sem que o Carregador(Clip) esteja devidamente inserido. 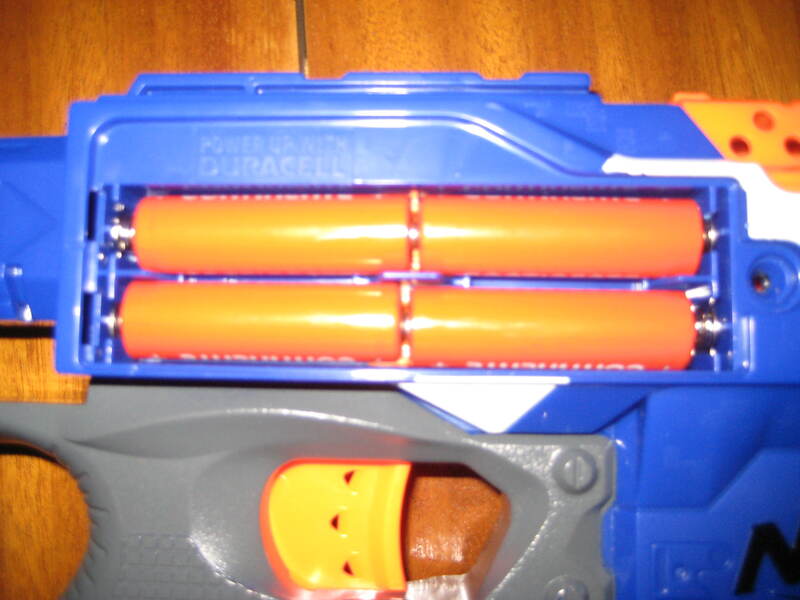 To rev the blaster, we need to open the Batterie Compartment with a Screw Driver. We insert the batteries, and close the Batterie Compartment again with a Screw Driver. 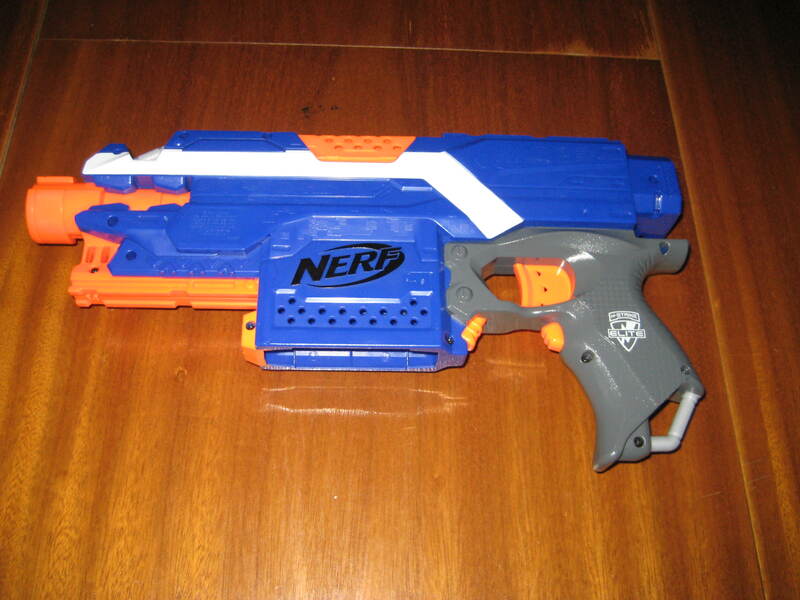 I should remember that the blaster will not rev without the Clip. Devo dizer que esta blaster é semi-automática, é muito calada em relação à anterior Barricade e até mesmo à Rayven e que é muito leve. 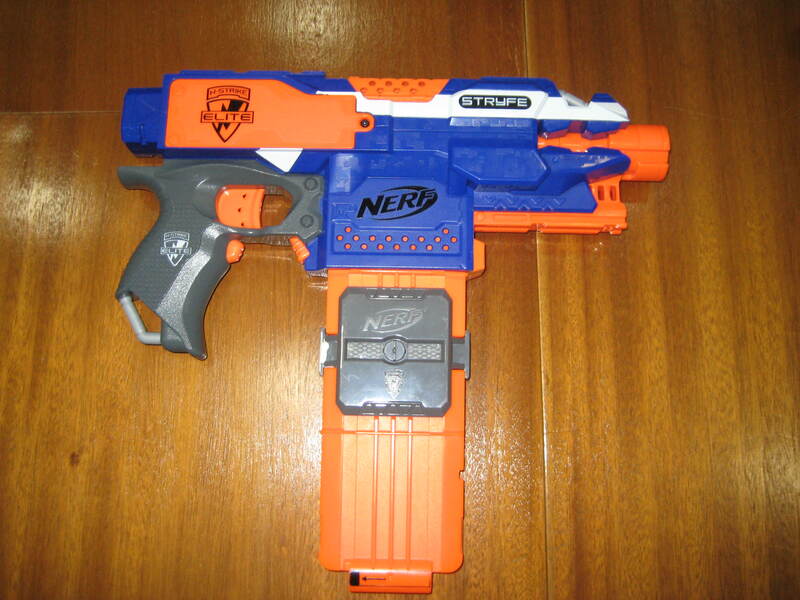 Não sei se devo considerar esta Blaster um Secundária (Secondary) ou uma Primária (Primary). 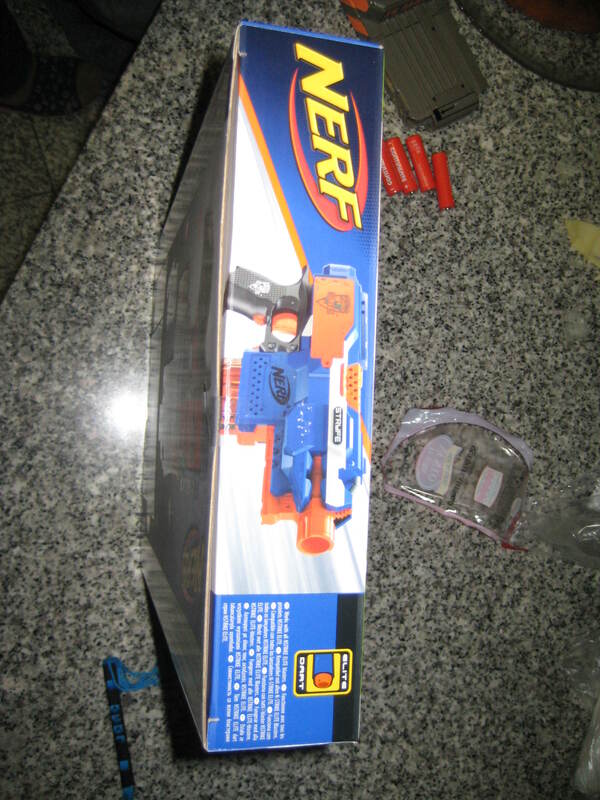 Se esta blaster for uma Primária de certeza que se pode comparar a uma SMG (porque é um estilo mais compacto). Eu acho que a minha Stryfe tem o Bloqueador (Lock) maior, ao contrário daquele mais pequeno de que toda a gente falava, deve ser da segunda geração como a do “Duke Wintermaul” (do Youtube). 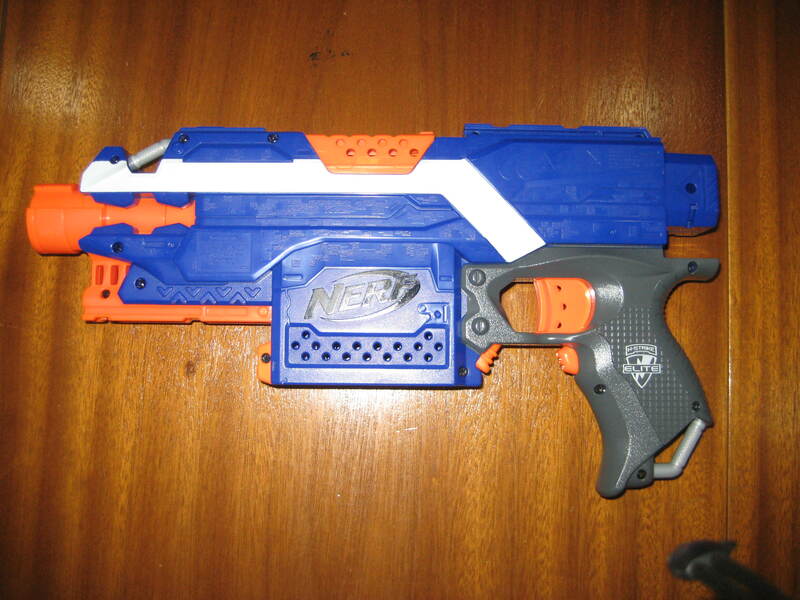 I should say that this blaster is semi-automatic, it´s very quiet compared to the Barricade and even the Rayven and it´s pretty light. 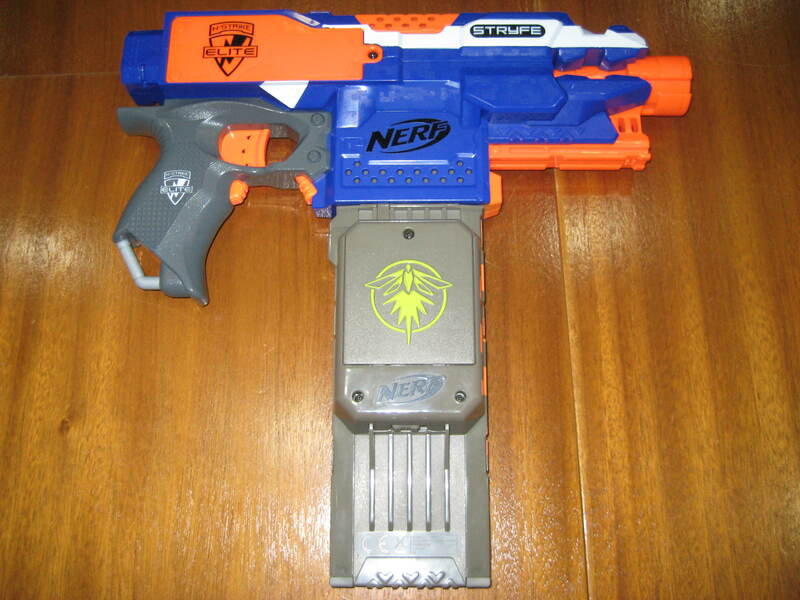 I don´t know if if I should consider this blaster a secondary or a Primary. 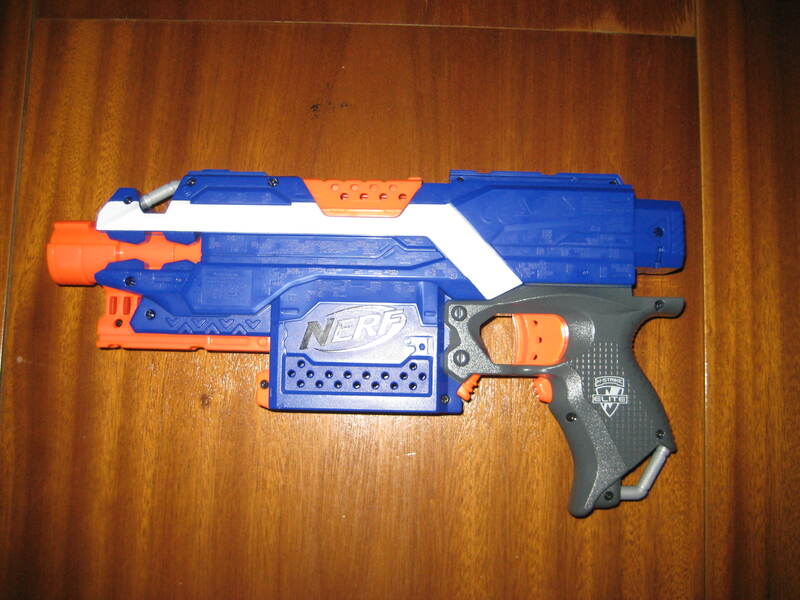 If this blaster is a Primary, it´s probably a SMG (because it´s compact). I think my Stryfe has the bigger lock, it must be from the second generation, like the one of the “Duke Wintermaul”(on Youtube). É a minha Blaster favorita: tem ótimos ranges,é compacta, é apenas espantosa. 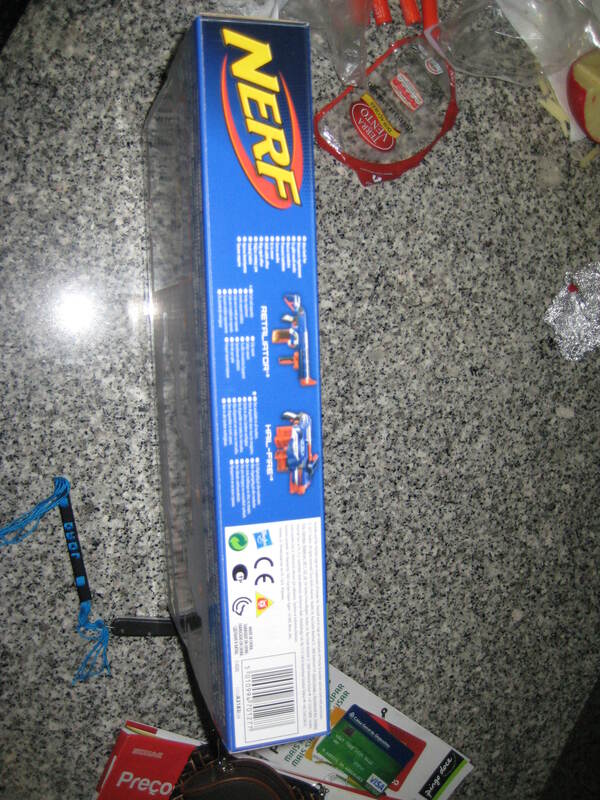 Se tiverem o dinheiro e quiserem comprar um Nerf, penso que devem comprar esta. It´s my favourite Blaster: it has great ranges, it´s compact, it´s just amazing. 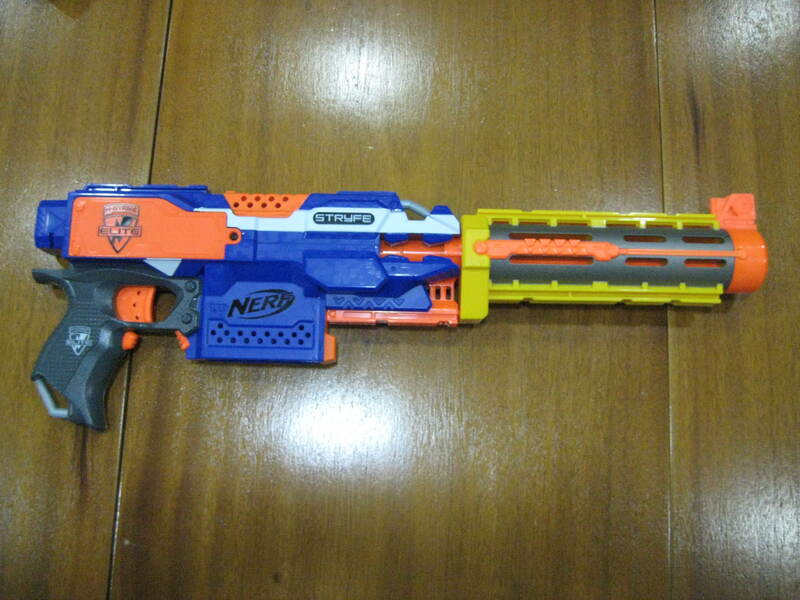 If you have the money and you wanted to buy a Nerf blaster, I think you should by this one. Espero que tenham gostado. Deixem um comentário em baixo. Hope you liked. Leave a comment bellow. what can I say… I hesitate a whole lot and don’t manage to get nearly anything done. It’s enormous that you are getting thoughts from this article as well as from our dialogue made at this place. It’s remarkable to pay a quick visit this web page and reading the views of all mates on the topic of this post, while I am also keen of getting familiarity. I’m going to bookmark your website and keep checking for new details about once per week. I subscribed to your RSS feed too. Great website you have here but I was curious if you knew of any user discussion forums that cover the same topics discussed here? I’d really like to be a part of group where I can get responses from other experienced individuals that share the same interest. If you have any recommendations, please let me know. Thanks! I’m extremely pleased to find this page. I need to to thank you for your time for this particularly wonderful read!! I definitely savored every little bit of it and I have you saved as a favorite to look at new things on your blog. 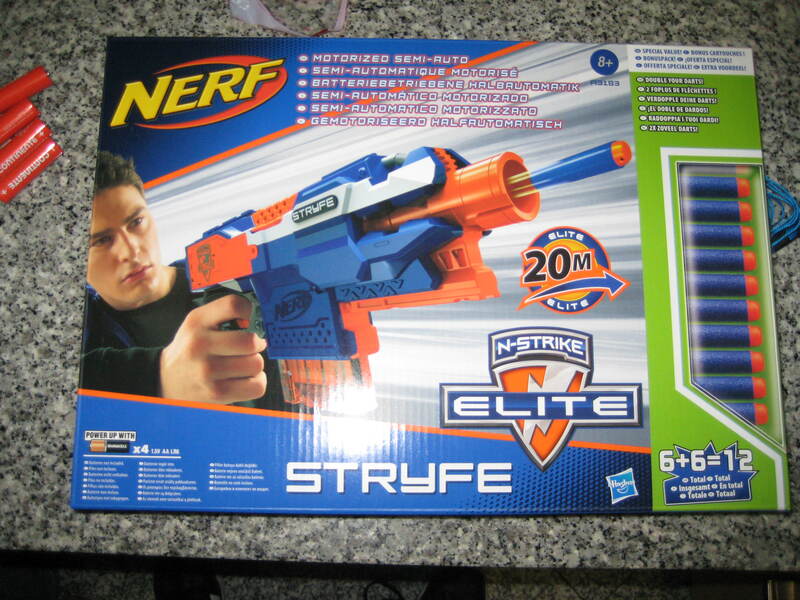 I wanted to share with you that, I bookmarked Review: Nerf Elite Stryfe | ExtremeNerf at Pinterest so my coworkers will read it also. Could I also share a tip. Getting into Medical school can be very tough. I find it most advantageous to talk with a chiroractic care specialist. Their chiropractors can make a huge big difference into you getting into a pain free lower back or not. Seek out a costa mesa chiropractor to ensure that your headaches and low back pain ar a thing of the past. Thanks. Hiya Personally this place is fantastic place to good resources, I’m going to follow you keep the quality articles coming and I’ll keep coming back. This is a great blog, could you be interested in doing an interview regarding how you created it? If so e-mail me! Thanks, I’ve recently been seeking for info about this topic for ages and yours is the best I’ve discovered so far.